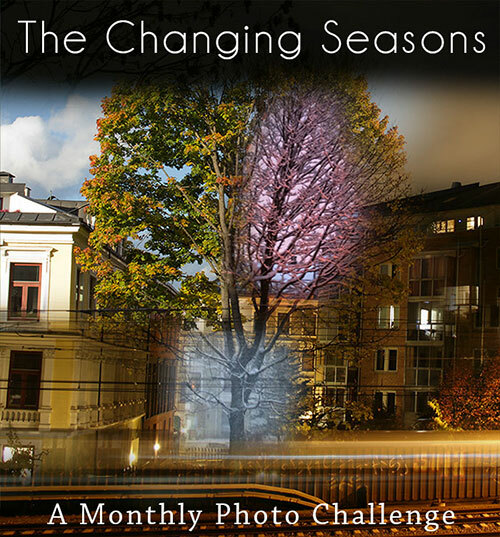 For my monthly photo challenge «The Changing Seasons» this month, I experimented with the shooting technique. These shots were taken after having 5 or 6 beers with a friend. After the beers I got on my bicycle to ride home and decided to take photos on the way, so around half of these were actually shot while riding my bike with one hand on the bars and the DSLR in the other hand (almost a kind of extreme sport). I was pretty much shooting on random. The results of ‘shooting & riding’ was (of course) plenty of blurry, totally useless, shots that I deleted, but some of them turned out OK. The rules of this monthly photo challenge are simple and the idea behind it is to get you to shoot often and continuously – to capture the changing seasons throughout the year. I started this challenge in January with photos that I shot in December, so in this gallery I present the photos that I took in April. Click the image below to see my previous posts, or read this post to learn how to Create a list and follow tags in the WordPress reader. Links to your posts will appear here after you’ve posted them, but don’t be afraid to leave a link to your post in the comment section too. This entry was posted in Cityscape, Night Shots and tagged #MonthlyPhotoChallenge, #TheChangingSeasons, 2015, Monthly Photo Challenge, Night photography, Oslo, spring, street photography, The Changing Seasons. Bookmark the permalink. I like these shots – you get a sense of the real city. It looks pretty cold out there. I’m glad you didn’t fall off your bike. I’m also very glad that I didn’t fall! That could have been expensive! You’d have been more worried about the camera than yourself. BTW I only just realised that your blog name comes from a Louis de Berniéres book. I read The War of Don Emmanuel’s Nether Parts years ago but didn’t realise it was part of a trilogy. You should read the other two books as well. Brilliantly written! Have you read the rest of the trilogy yet Michelle? Haha! Just realised you were referring to Don Emmanuel. Good reminder to read them. I need a good book at the moment. Thanks! I’ll let you know what I think of them when I’ve finished. Anything the “Cardinal” does is “liked” by me. Thanks for the support Barry. I like your new gravatar. I agree with Mara. Riding and shooting? How on earth did you do that, especially after the beer? High ISO, f-stop 4, continuous shooting, manual focus set to some random spot in the far distance, one hand on the steering wheel, the other hand on the camera with a finger on the trigger. Pedal, steer and shoot away into the night. lol. You’re much braver than I. Not bad considering you were riding and shooting at the same time. A good job the police in that car didn’t spot you though 😉 Nice to see the snow has all gone at last. The snow has gone and I sure don’t miss it! It’s very good that the police didn’t spot me, because you’re not allowed to ride a bicycle after drinking alcohol – you can actually lose your driver license (your driver license for car). Only half of the shots were shot while riding (it’s easy to spot which ones). Great shots yet again ~ you do have the magic to bring the night alive. Thank you very much. Now that I’ve moved back closer to the city center, I’ll probably be doing more night photography again. Hello Cardinal! Long time no talk. Amazing photos as always. I especially love the selfie. I try to stay on my bike with two hands and (almost) two feet on the ground. Haha Yours is true talent! Yes, long time no talk! You/I went under the radar there for a while. What a great way to grab photos. Happenstance can usually rule the day. Inspiring. Thanks for the comment and for teaching me a new word Brandon. Happenstance – tilfeldigheter. But you came out of it fine, and another experience clocked up! Nice gallery, Cardinal. As I bike and shoot as well here in Amsterdam, I’m not surprised with your shots. However…and that’s a big however, I do it without having had a beer and not night photography…so my dear pro shooter, you’re definitely excellent at this. Even though you aid that some were blurred, even that one of the won and the dog are stunning. I had to delete a lot of photos! The success rate was approximately 10% (If I remember correctly I came home with around 220 shots and ended up publishing 23 of them- the rest was deleted). A typical example of what’s called ‘spray and pray’. That’s fine! I read another day that a photographer needs to hit 100k (digital) photos and make 10k right to learn the craft. I’ve read that too somewhere (probably in some online article on photography or in aphoto forum), but I wonder where they came up with that number? It seems like just a random number that someone once came up with. I guess that the success rate depends on thing like: if the photographer has gone through photography school, if he/she’s self taught, how hard he/she’s been studying the craft and of course things such as passion and/or talent. I think it was a blogpost from a photographer. He also used this to say that practice makes one better and not necessarily talent. He said that at Cartier Bresson time, the number would be 10k. What you said is a mix of key ingredients to make a good photographer. I would add sensitive eyes to the list. Having all of the rest and not being able to see beyond the obvious and express the ideas behind the image, may just produce a technically perfect photo. I’m an amateur too, but we’re still entitled to an opinion even if we don’t make our living as photographers or never attended photography school to learn the rules and how to operate our cameras. There’s a lot of technically perfect, but boring photos out there. But if there are levels 1-10 amateurs, you’re number 1. Of course 1 being the best. Yes, we are entitled to it. And we have much more freedom to speak as we are not paid by any camera manufacturer. I’m sometimes appalled with the recommendations and reviews I read, only to see that the person is sponsored. Tons of technically perfect and heavily post processed photos, which look like crap to me. Bike and shoot… with my small point and shoot camera… maybe… but DSLR… uuuu….. that is really extreme sport. given 5-6 beers :-). Nice gallery. My absolute favorite is you on the bike. I don’t know, something about lines and reflections really cought my eye. I can assure you that I’ll never do it with my new DLSR again. My small point & shoot isn’t good enough (it would just be constantly struggling with the focus), so if I’l ever try to re-create something like this, it’ll have to be with my old DSLR that I don’t really care about. Cool ride! Considering the extra challenges you describe – no, delete that: These pictures are great. I really like the light and the colours here. I especially gasped at the sight of the half pipes (if that is what you call them in English). …and I do wonder about the size of “one beer” in this case. There used to be times when I would not really get drunk until I had eight or even ten beers, but those were 0.2 l a glass (in Cologne that’s the normal size). So when when somebody in Munich told me that she “lost it” after three beers, I really wondered how little this little woman could stand. But I was soon to be corrected. For them, “one beer” is one litre by default. Cheers! Thanks Tobias! That’s a skate bowl in the photo, a half pipe (also called a skate ramp) is a half pipe with an extension in between the curved areas. This skate bowl was built by some local people in the neighborhood: it used to be just a vacant lot filled with garbage and a typical hang-out place for junkies. One beer in this case means 0,5 liters – so a bit tougher than Cologne, but not as bold as in Münich. What an amazing skill you have, Cardinal. You multi-task very well after a few beers – either you knew your drinking limits or those were really weak 5-6 beers. I read the comments above, and you mentioned high ISO. These shots turned out very well, not too grainy. Doesn’t look like there was anyone around to laugh at you and think you were a madman. I can’t take credit for stopping drinking when we did. My friend had to go home on the ferry, so that’s why we stopped. I probably would have kept going for a few more. No fair that you take pictures than I do while drunk and riding a bike!!!!! Or maybe that’s what I should try for next month’s challenge…… LOL! And now I see that the key word is missing from my original comment. BETTER than I do. Better. Thanks! I left a comment there now. Yes, it’s still the same neighborhood. My secret is that I chose “downtown Oslo” as my neighborhood – that way I knew that I could keep on producing shots. Luckily I didn’t choose the neighborhood that I’ve just moved from! There’s no way that I would go back there each month to snap photos now! 😀 Hehe. 😀 yes, that was a good call. Photographically speaking it was a very boring place, so that’s why I didn’t choose it really. It was all in all a pretty boring place, but great for kids. I understand. I hope the other places will be good and safe for him too. I know you said your success rate was only about 10%, but the result of your 10% is pretty impressive! Thank you joanne. It’s important to have some fun every now and then, after all: “all work and no play makes Jack a dull boy”. Thanks for the entry Andy, I’ll have a look tomorrow. Fun & risk often go hand in hand. I’ll admit that the thought of ending up with a cracked lens and/or camera struck me more than once during that ride! ….this meme is great…maybe I will start next month…or maybe even this month! Yes, please join. The more the merrier! If you re-visit this post in a week or two, you’ll see that the link list has grown and you can follow the seasonal changes around Australia, Europe and North-America (unfortunately there’s no participants from South Ameria, Asia and Antarctica yet). My gallery contains photos that I shot in April (because I started the challenge on the 7th of January and had photos from December), but I know that many of the participants follow the month and will post photos from May in their post #5 (which actually makes more sense). Thanks for the entry and I hope you’ll have a fantastic stay in Portugal! Send my greetings to hubby! Once I was so wasted that I was zooming in and out on the floor when we were at this cultural happening with dancers in Cape Town. Well that’s what the others told me/how they perceived it. We’d been to wine tasting prior to that.- All the others spat out the wine after tasting it and enjoyed a glass or two during the lunch afterwards. I drank everything that I could get my hands on that day. So, when the evening came and we had dinner and there was this cultural blah, blah with the dancers, I was already so drunk that I couldn’t understand how to operate my own camera. I think that what they saw as me zooming in and out on the floor, was probably just me trying to fix some settings and check the camera. I believe it was later that same night that I was kicked out from a whore house for being too drunk and making a scene (but it might have been on two separate nights). I could easily have ended up in a heap too, but luckily I didn’t! This is a great idea. I plan to participate. Thanks for an interesting challenge! Join the fun! There’s still plenty of months left to document the rest of the year! Es preciosa la foto de Oslo de noche. Thanks Viaja and thanks for your entry! Great gallery. Things have finally gotten less hectic around here. Good story to go with the photo tour. The purplish skateboard area stood out to me. It’s a cool area. Sometimes they arrange concerts there (underneath the bridge I was standing on when taking the photo). Great photos and night photography! I recognize the conference center, I believe, which I also only saw once, by night. Was it at the Nobel Peace center? My favourite shot would have to be the last one. It’s a good view from up there. Perhaps I’ll go back there one night to shoot some more. In the autumn or something, so I can post it for this challenge later. I am impressed at your skill: riding and shooting pics. Go you! I would have crashed into something for sure. But maybe I can test this tomorrow on my ride. Wait. I am going on a trail ride. This can only end in disaster, lol. Anyway, great job and thank you for hosting this challenge. It is fun and inspiring to me and making me get out of my little comfort zone and try new things. It is even making me be somewhat less antisocial. Here is my late contribution for this month (with some tripod use like we discussed): http://wp.me/p58fTH-St.
Great diversity in your gallery. I’m looking forward to see more of the night shots. Less antisocial is good, I’m glad that I can indirectly contribute with things that I hadn’t even thought of when starting this challenge. I have a number of the multicolor fountain shots coming. I supposed they are all pretty similar but with different variations of lights and height of water. It was quite addicting playing with the camera then. Yeah, I tend to go out by myself a lot and keep to myself when I do. However, this month, people were approaching while I was shooting. So I am working on that social interaction with strangers thing, lol. And yes, that is totally your doing since I was shooting your challenge. That’s cool. I’m planning to do some more street portraits this summer, which will force me to interact with people. I also got my external flash today, so as soon as I’ve learned how to fully operate it I’ll experiment with that too. Let me know how that goes. I would love to do more street photography but I am a bit hesitant to approach people. And….flash….I definitely need to work on that. I can do the very basics. I need to work on my flash skills too. Going to Poland in a few weeks to shoot some studio shots, so I’ll get the chance to practice then. Oh, and have fun in Poland! Putting “the journalist hat” on is a very good idea. I’ve worked for a short time as a freelance journalist, so I guess that I’m subconsciously doing that too. Great photographs for this month CG — and I see no more of that white stuff on the ground. Amazing really, despite the beers AND while riding your bicycle! By the way, all the best with your new place, and your own transition (no T.V. can be a good thing 🙂 ). I’m all for rule bending and range extending! Hahaha, that can be on a T-shirt. It showed up today, just minutes before you wrote your comment. That’s why it’s always good to leave a comment with the link. Thanks for the entry Debbie!